Saturday, May 11, 2019, 2:00 p.m.
Commencement is the ceremony in which you celebrate and share the excitement, and importance, of your academic accomplishments with peers, family and friends. Participating in commencement is optional, and is not required for your degree. Registration closed on April 15. A rehearsal will be held on May 9 at 1 p.m. in room 101. If you would like to do a walk through, all graduates are welcome to attend. A link to a livestream of the ceremony will be available on the commencement page. There will be an opportunity for graduates to get their picture taken with a diploma from 12:00 – 1:00 p.m. This will take place at WSU Everett. Parking for graduates will be available in parking lots J and K. Family and friends should park in lots J and H on the west side of Broadway. If you do not take a diploma photo beforehand, please arrive at WSU Everett by 1:00 p.m. and go to room 101 for robing. This is where you will fill out a reader card to write your name as you want it to be read and line-up for the ceremony. At 1:40 p.m. graduates will proceed in line from WSU Everett’s north entrance (on Broadway) to the Walt Price Fitness Center. Broadway will be closed to traffic for a few minutes by the Everett Police Department to allow students to cross safely. Your cap and gown are your admission ticket into the commencement ceremony. Please leave valuables (purses, bags, etc.) with family members prior to meeting at WSU Everett as there will be no secure place to leave these items and WSU Everett will be locked as soon as the ceremony begins. The ceremony will be approximately 90 minutes long. Helium balloons, strollers, car/baby seats, tripods and air horns are not permitted in the Walt Price Fitness Center. Please remind family and friends of these rules. The regalia drop-off station will be at the Walt Price Fitness Center. Line up at the station to drop off your gown and yoke and get your name crossed off the list. If you still plan to take photos with your cap and gown following the ceremony, you must return your regalia to WSU Everett room 110 C by May 17 at 12 p.m. You may keep your cap and tassel. Photos taken with diplomas at WSU Everett from 12:00 – 1:00 p.m. and on stage during the ceremony will be sent to students’ WSU email addresses within a couple of weeks of the ceremony. There is no charge for the digital photos, which students, friends and family may have printed as desired. Parking at Everett Community College will be free of charge for the ceremony. Guest parking is available in lots K and J. 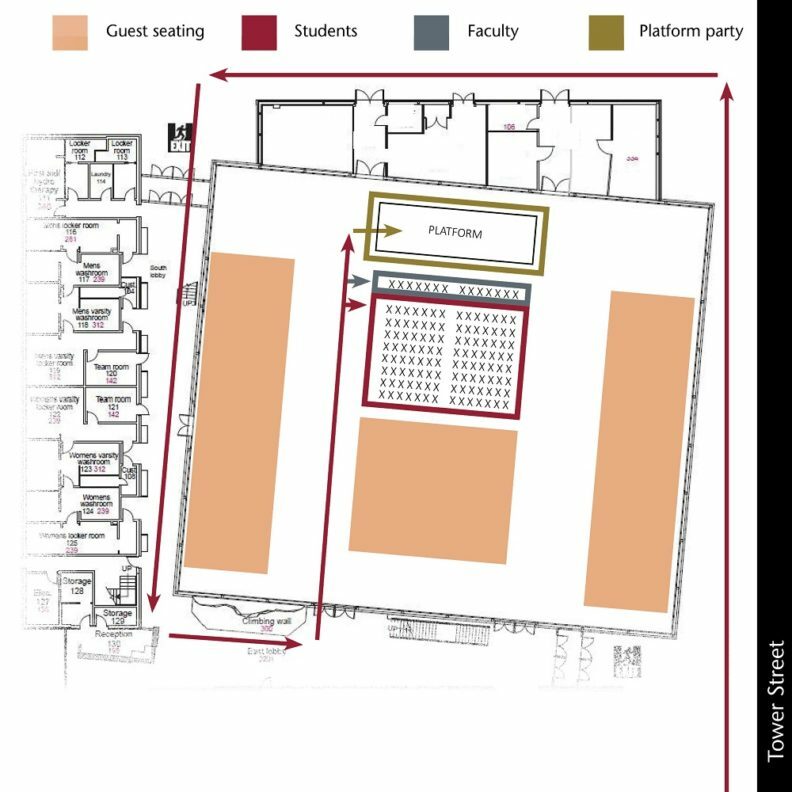 A map of the campus can be found here. The commencement ceremony will be approximately 90 minutes. Outside food or drink, helium balloons, strollers, car/baby seats, tripods and air horns are not permitted. Please do not come with your graduate to the WSU Everett Building, guests must go directly to the Walt Price Fitness Center. Doors open at 1:00 p.m. at the Walt Price Fitness Center. The ceremony will begin at 2:00 p.m. Guests with hearing and/or mobility impairments are highly encouraged to arrive early. There will be a section reserved for ADA seating however, we have found this fills very quickly. We request that only one guest accompany each person requiring ADA seating. There will also be two ASL interpreters at the front of the stage. Please contact Kimberly with questions. The processional will begin at WSU Everett at 1:40 p.m. Lined up in order will be the platform party, followed by faculty, followed by students. At 1:50 p.m., the Everett Police Department will close North Broadway at Tower Street for two minutes to cross the street. The processional will walk west on Tower Street to the back of the Walt Price Fitness Center, turn left (south) and enter through the southwest entrance. Once inside, follow the leaders to the east lobby. Once there, the event director will release everyone individually to their seats. First, the platform party will be announced individually and proceed to the stage. 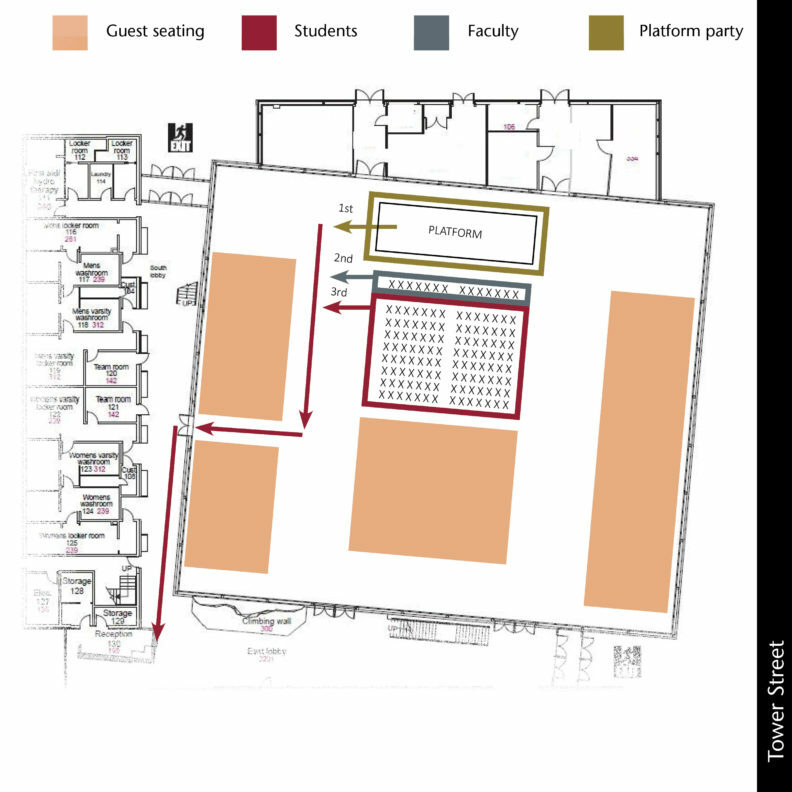 Second, faculty will be released to the front row in front of the stage. Third, students will be released to sit in row 2-9. Students, please walk all the way to the end of the row. Gonfaloniers should ask that the student behind them save them a seat while they place the gonfalon next to the stage. Students should stand one row at a time and proceed to the right to the end of the row. Then walk toward the corner of the stage to hand your reader card with your name to the reader. When you hear your name read, proceed up the stairs to the stage. Remember to move slowly, stop to receive your diploma with your left hand, shake hands with Chancellor Pitre with your right hand, look at the camera and pause for your photo. Then proceed toward the other end of the stage, shake hands with your college’s dean and proceed off the stage. Return to your original seat. 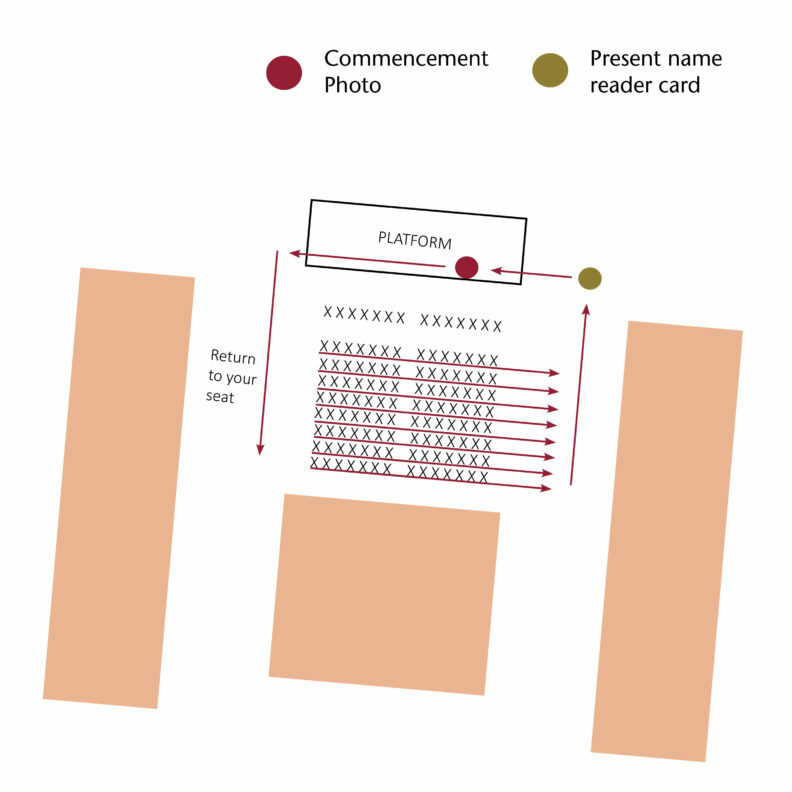 The platform party will exit first, followed by the faculty, followed by the students. Everyone should exit to the south, through the door in the middle of the southern bleachers. Once you are in the hall, proceed to the main entrance. Outside of the main entrance is the Regalia Dropoff Station. Reminder, you will not have access to WSU Everett following the ceremony. Guests are asked to exit only after all students have exited the gym.